In today’s scenario, Disposable Emails have arisen a bigger problem for all websites runner. …they register with a valid id(valid for small time spam) in our website. …with the help of any free disposable email provider and then user register in our website. With the same email-id and user get success because of it’s valid domain. After some time spam, user email id becomes invalid but user already would have entered in our website. …as we store email id in our own database and user can access it without any probs. …which actually do not have existence. It seems like garbage collection for us. MailGet is an online email service provider which allows automatic email cleaning and email list management facility. Using such valid email lists you can send send Bulk Emails to large number of clients without being worried. You can easily connect and configure it with different SMTP service providers, e.g MailGun, Mandrill, Postmark etc, to send Emails. By removing these emails, we can save a lot of time, storage and can stop many other unusual impacts which occur because of disposable emails. You can also make a better Email Campaign after removing these disposable emails which can increase your email inbox delivery rate. Don’t worry.! we came up with a proper solution for this problem. Here user will see a form, users have to enter an email address and clicks on the search button. The result is displayed on same page identifying whether an email is disposable or not. This is a 3-way check where we are checking emails in 3 steps. In this case, we are storing all possible disposable email addresses in a text file.No user will be allowed to register in our website with these email addresses. In this case, we are disallowing those users who are trying to register with an invalid domain itself. In this case, we are matching domains(without extension) and domain pattern of all possible disposable email provider sites.Any email address with this domain will not be allowed to register in our website. In ‘demo@xyz.com’ we can make a pattern like ‘XYZ‘, ‘X‘, ‘Y‘ and ‘Z‘.Any email coming with this pattern will not be allowed. …in every short time spam new disposable email addresses are generating and new service providers are emerging. So we have to keep updates with time, for monitoring these disposable service provider. But no need to worry ! 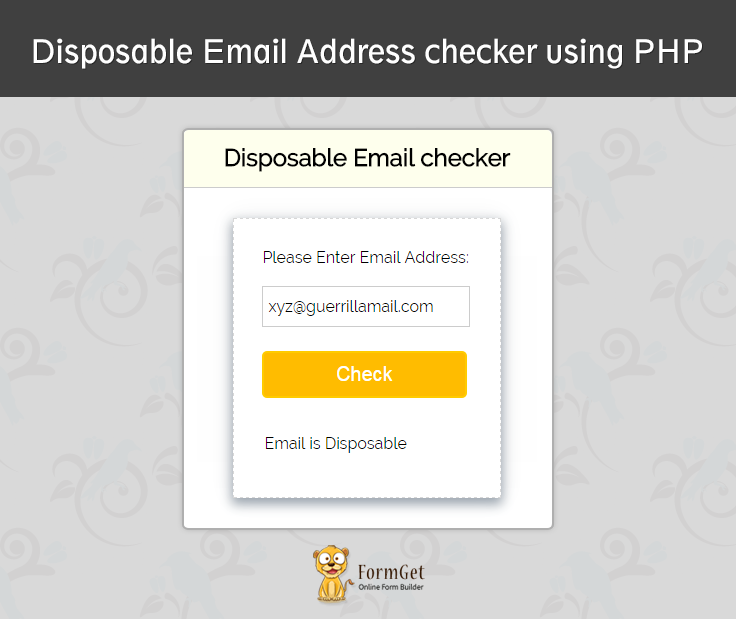 with this script post we can remove bulk of disposable email addresses. This index.php file contains the major functionality of the script.While executing this code user see a form, see the image above.User has to enter email address and after clicking on submit button user gets the result,whether email is disposable or not. * fetching disposable emails from text file to array. * checking , if domain exist or not in DNS. * Checking the domains of all possible disposable emails providers. This file takes care about all designing working occuring in form, you can change it according to your requirement. We have very large collection of disposable emails in this file. We keep it updated with time. Hope you would have learned & enjoyed from this blog post and would have got a clear picture about disposable email. I am sure you will give a try to the script provided and implement it in your own projects as well. Feel free to visit our website again in the future to get in touch with new coding tricks. You can let us know about your feedback in the space provided below. Thank you for this fine article. The script would be a very fine one to study and implement. Fake emails are a problem to Web developers today and this is the way to go in handling it.